← Planning a TechEd session. It wasn’t the best Friday, my external hard drive died taking my work iTunes library with it and I wasn’t having much fun with AppFabric either. The dashboard showed no data and the Windows application event log kept filling up with login errors. Looking back, the afternoon was useful since I learned that little bit more about AppFabric though I didn’t get any ‘real’ work done. 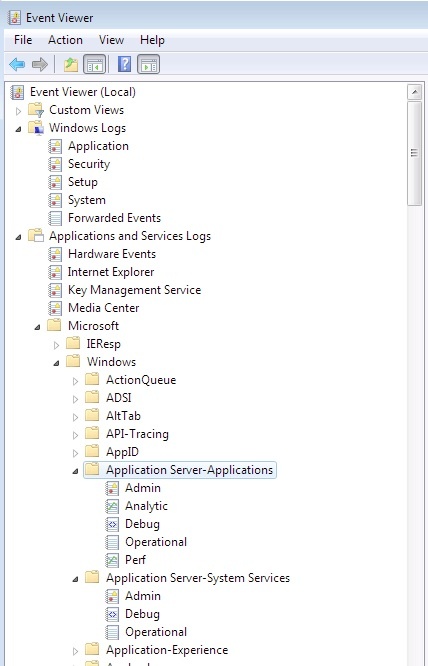 I started off reading this: http://social.technet.microsoft.com/wiki/contents/articles/appfabric-items-to-check-when-configuring-appfabric-monitoring.aspx before getting stuck in. AppFabric has two data stores: a monitoring store and a workflow persistence store. These stores are paired with two Windows services, an event collection service paired with the monitoring store and a workflow management service paired with the workflow persistence store. Lets start with the event collection service and monitoring store. This service is responsible for capturing the WF and WCF events emitted by services hosted in IIS/WAS and storing them in the monitoring store. These events are used to populate the dashboard that is integrated into IIS Manager. To enable capture of events you can use the ‘Manage WF and WCF Services | Configure…’ option in the web application context menu or the Powershell commands Set-ASAppMonitoring and Start-ASAppMonitoring. For help on these commands call get-help, e.g. ‘get-help Set-ASAppMonitoring’, from a Powershell command line. When you set up monitoring you need to provide a connection string name and set the monitoring level. 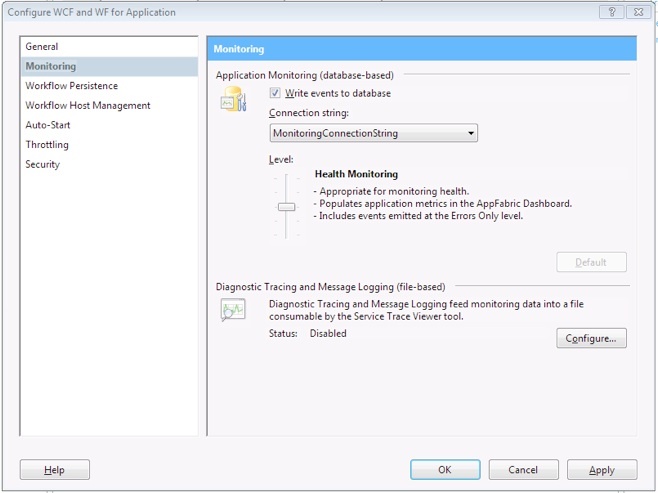 As a minimum, the level needs to be set to Health Monitoring to populate the AppFabric dashboard. Below this are the levels Off and Errors Only which are self explanatory. Above this level are End-to-End Monitoring and Troubleshooting both of which capture additional information. End-toEnd Monitoring adds a header into WCF traffic to allow a logical call sequence to be followed. When a WCF service calls another WCF service the header is flowed across the call providing a correlation token for querying by. Note that the capture levels are cumulative, the higher level setting includes all of the events from the settings below. The higher the setting, the greater the impact on the performance of the system as more resources are required to capture and log the monitored events. For day to day operations health monitoring is recommended with the more verbose options used when required to aid troubleshooting. The connection string is a named connection string value, set as a property of the web application (or one of its ancestors). The connection string dashboard page is available from the ASP.NET section of the Features View for the web application. Note that IIS configuration is hierarchical, the connection strings available to the Magic8Ball web application are both inherited which means they are defined at a higher node in the tree. In this case the strings are defined in the machine web.config found at %SystemDrive%\Windows\Microsoft.NET\Framework64\v4.0.30128\Config (I’m using 64-bit Windows and .NET 4.0 RC). When installing AppFabric the default connection strings are written into the machine level web.config. In my case, both connection strings are set-up to use integrated security. The event collection service is a Windows Service and so managed through the services administration snap-in, services.msc. To help set up integrated security from Windows through to SQL Server, I run the services under a domain account. Note that if you plan to use a machine that is not always on a domain, you need to use a local machine account. This account needs to have login rights to the SQL Server and should be mapped to the ASMonitoringDbWriter role. In my case I’ve mapped the user to all three roles set up in the monitoring store. The SQL Server Agent must be running on for the tables to be populated. The Import*Events jobs run every 10 seconds by default, if they are not correctly set up your application event log soon fills up with errors and warnings (as I found). 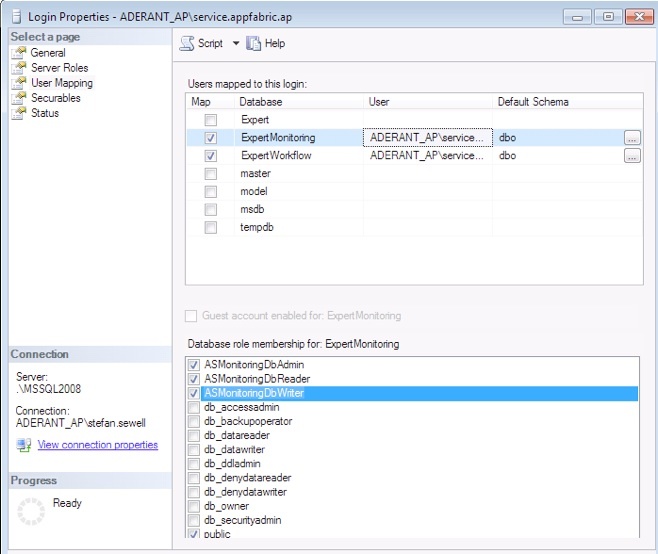 These jobs call stored procedures defined in the monitoring database: ASImportTransferEvents, ASImportWcfEvents, ASImportWFEvents and run as the AS_MonitoringDbJobsAdmin. The AutoPurge job is scheduled to run once every minute and calls the ASAutoPurge stored procedure. These stored procedures in turn call ASInternal_* versions of themselves and you can drill into the SQL to see exactly what they do. To housekeep the monitoring database you can use the Clear-ASMonitoringSqlDatabase command. An other option is to move the events to an archive database so that the queries feeding the dashboard remain responsive, see Set-ASMonitoringSqlDatabaseArchiveConfiguration. The archive database can then be managed as per any audit requirements you may have. The Windows Event Viewer is a great help tracking down the cause of issues and AppFabric sets up a couple of customs logs. Right click on a debug or analytic log and enable it. Make sure you disable it when you are finished to prevent performance degradation due to high volume event capture.